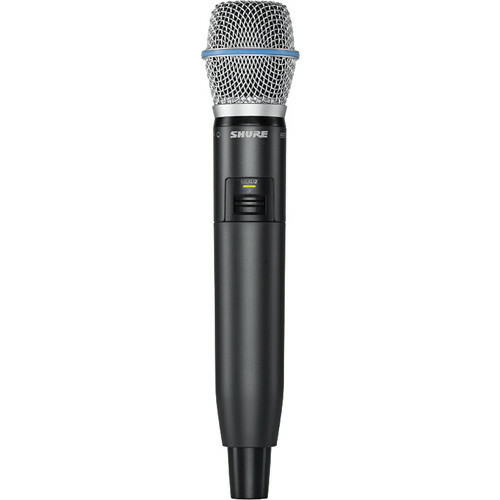 The GLXD2 Handheld Transmitter with Beta 87A Microphone Element from Shure is designed to work with Shure's GLX-D series digital wireless systems. It operates on Shure's Z2 frequency band between 2400 and 2483.5 MHz on a 2.4 GHz ISM wireless band. The transmitter provides up to a 200' range of operation and features Shure's LINKFREQ automatic frequency management that allows it to automatically link to a GLX-D compatible transmitter without having to perform any setup. It includes a rechargeable battery pack that provides up to 16 hours of performance time per charge. The battery can be recharged with the included USB charger cable or with the integrated charger in the GLXD4 wireless receiver. A 15-minute charge can provide up to 1.5 hours of performance time. Box Dimensions (LxWxH) 11.0 x 5.3 x 3.3"